Service men were excellent and explained everything. Only problem was when they drilled a test hole in the exhaust pipe to take some readings. They did not block it up so that when the furnace is running you can smell the exhaust out of that hole. Would highly recommend that they not leave it that way in the future. Timely, thorough, neat, clean and professional. Great service! Very knowledgeable technician who explained everything he needed to do! Brian checked the system completely. He had been here before and was familiar with the system. The service tech that was here on Wednesday couldn't complete the job. Brian completed it and it is working fine. I don't know the cost/pricing of the service. Greg was very personable and professional. Great job!! I had my heating duct repaired. The response time was very quick. The service technician was extremely professional and courteous. He explained exactly what was needed to repair the duct and went over the work when completed. Greg knows his job well. They explained what was being done and were very patient. There was a lot of work involved in getting 2 units installed. Were flexible in how we wanted the connections. Dana the installer was very helpful, and explained everything very well and made sure we didn't have any questions before he left. Vinny was very knowledgeable and attentive to detail. He was concerned with safety of both furnace and oil tank. Very personable, too. Service man was professional. He explained to me what he had done in the annual servicing. Set up a work order for parts to be replaced. Then there was an overnight glitch when the heat did not automatically turn on. Townsend send a serviceman to reset and examine the burner. System has worked since then. Pete was very professional and performed the task with total knowledge was very friendly and answered all questions to my satisfaction. I had a serious leak in my boiler and called Townsend for immediate help. I received a call from Tony within 15 minutes and he was at my home about an hour and a half later. He was so professional- he called again when he was on the way to my house and lastly, when he had finished, he called with a thorough update of what he had done, the follow up I needed to do and to tell me that the leak had been resolved. Tony has made service calls at my house in the past and his performance today was typical of his work. I commend him for his service. Great service! Nice guy! Harry was very thorough and explained what he was going. Couldn’t ask for more. Delivery driver Tom is unfailingly cheerful and accommodating, and careful of the landscaping. Anthony is very friendly and genuine guy. Most importantly the service was excellent. Knowledgeable, honest and professional. Brian M is a great credit to your Service Dept. VERY GOOD COMMUNICATION. THOUGHTFUL ANALYSIS AND EVALUATION. DISCUSSED PLAN GOING FORWARD. THANKS, GREG. Got here in about an hr. Fixed the problem. Service tech was A nice guy. Greg arrived on time, actually remembered us from prior maintenance, got right to work, and provided clear report of condition of the heating system. Brian arrived shortly after we called. Fixed the problem in a timely manner. Made sure he told us what was wrong and happening the whole time. He was very friendly and pleasant. Brian was professional and informative. We were thrilled with his service. I appreciate Brian’s observation that we should have a water pan switch installed for the air conditioner. Rapid response to call for service. Quickly identified problem and solved issues within minutes. Brian M and Matt S. Servicing 2nd Floor Conference Room , Fujitsu Ductless Air Conditioning System. 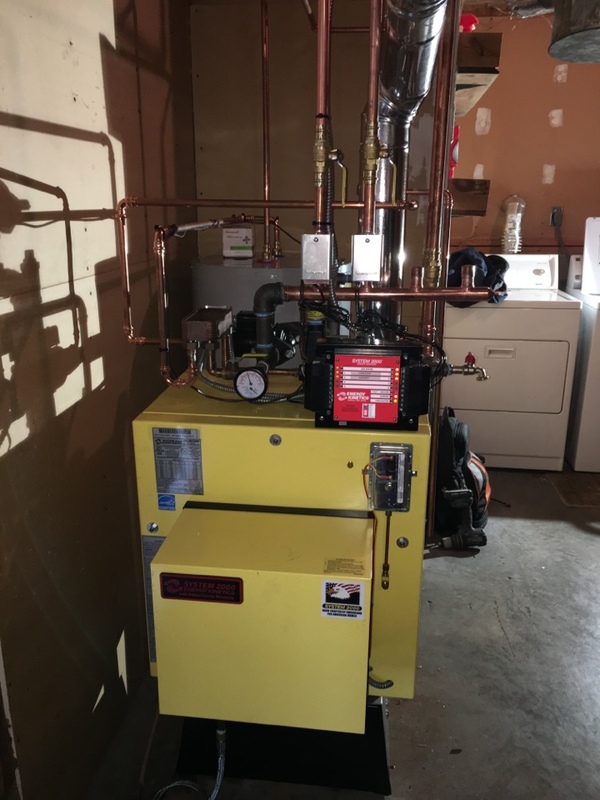 Reviewing new Buderus Direct Vent Boiler. Tuning up Central AC System. Tuning up Weil Mclain #62 Steam Boiler with Carlin 175-FR1 Bioheat burner. Installed new Water flow sensor switch on Viesmann Vitodens 100-W lpg Combi Boiler.